Once a week my sister and I get together for a preschool day for our kiddos. This week was a special treat and we had a little field trip to the Fort Worth Museum of Science and History! They have a great new Curious George Exhibit! The kids had blast and so did I! Fun Times! My Kiddies LOVE Curious George! What a great kid museum! It must be nice to have a sister and do things with your kids together. Enjoy the special memories. Aww! fun cute photos heheh! That museum looks like a lot of fun! Cute photos! Thanks for sharing. Curious George is so much fun. The exhibit looks amazing. I bet the kids had a great time. You are a busy Momma! That’s a good thing. Oooo, wish I lived near you so I could take my kids to that exhibit! They would go wild! That was definitely not a field trip to be missed. So interesting. Thanks for hosting. Love when Curious George shows up! Looks like everyone had fun that day. 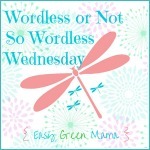 Visiting via Mrs.Tee ‘wordlesswednesday’ link up. What a fabulous way to spend a day! This looks like such an awesome place! I remember when my kids were young and our children’s museum had Curious George! It was so fun! Looks like you had a great time. Cool! What a fun place to visit! It must be so nice to be live close to your sister and have weekly outings together. Treasure those moments!